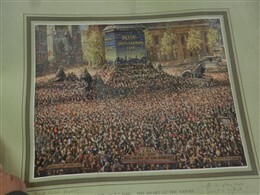 War Artist Frank Beresford drew this picture about the VE Day celebrations at Trafalgar Square. He was a great painter and even did an 18- month long international painting tour. He joined the London Regiment and served as an instructor during World War I. In World War II he was an instructor in the Home Guard and an official war artist for the Royal Air Force (RAF). He was also accredited to the United States Army and the United States Army Air Force (USAAF). There were mass celebrations in London on VE Day - 8 May 1945 - after Churchill, at 3pm, declared the war officially over. In Trafalgar Square young women and servicemen linked arms and swung along singing “Roll Out the Barrel” “Two Lovely Black Eyes” “Oh You Great Big Beautiful Doll” and many other songs. In Leicester Square people tried to do the conga and in Piccadilly Circus a sailor stripped off his clothes and climbed on top of the Eros statue pedestal, wrapping the Union Jack around himself. There are other personal memories that people share about VE Day. For example a woman named Eileen Holman talked about how she was by the arch at Buckingham Palace and how she got squeezed between two girls there. She also mentioned how these girls were wearing perfume and how she smelled like perfume once she returned home. She also spoke of how her mother noticed that she smelled of perfume and later asked her why she was wearing it. The reason her mother inquired was because perfume was not something that was worn as often in the 1940s as it is today. Other memories of VE Day include those of Nellie Hall. Nellie was a WAAF (Women's Auxiliary Air Force), a member of the women’s branch of the Royal Air Force. She recalls dancing with American soldiers at Trafalgar Square on VE Day. Harvey Gould had friends and family that owned two pubs. He recalled that he and his family would fill empty bottles with diluted fruit juice to sell in Trafalgar Square. Harvey also remembers witnessing men described as 'Spivs' trying to sell tea on the black market. They pretended that the tea was whisky. Harvey considered these men to be dishonest as they were exploiting soldiers who needed to have a drink. Trafalgar Square is a traditional site in London for national celebrations. From July-August 2012 Trafalgar Square will be used to celebrate the London Olympics. Large screens will also be set up in Trafalgar Square to display the Paralympics later in August. This page was added by Patrick Collins on 08/08/2012.